Juliet Kinsman finds five-star peace in a hi-tech Japanese haven. There’s no mistaking where in the world you are as you step foot into the award-winning Spa by Espa at the Peninsula Tokyo. Not only because the sixth-floor views overlook the city in motion from a poolside perch, but the look and feel of this wellness space is steeped in Japanese elegance. Discretely relieved of your footwear on arrival, you feel cossetted from a relaxing start to tea-sipping finish. Black marble, Yukimi-shoji screens, and delicate paper lanterns whisk you far away from the Marunouchi business district. Time here is an ideal antidote to a long-haul flight—if only for a dip in the indoor heated pool. Allay any jetlag symptoms with a signature Keihatsu Enlightenment Massage and the therapist will gently rub and stretch your circulation back to full effect. An Eastern Asia shiatsu technique where rolling movements and hot stones restore a healthy flow of Qi—that vital life-force energy that Chinese and Japanese cultures so rightly revere. And in a land where there’s even a special word for the phenomenon of people simply dropping dead from being over-worked—Karōshi—taking time to de-stress is incredibly relevant. Luxury is a much-abused word today, but at Peninsula Tokyo it means it in the classic sense—as well as chauffeur-driven Rolls-Royce Phantoms and the finest dining, service is polished but sincere. In the spacious, sophisticated guest rooms, there are easy-to-understand buttons for every conceivable need. Lit-up panels of well-explained buttons which even have the power to transform the ensuite bathroom into your own private. One press and —hey presto!— cue Japanese classical music and romantic soul-soothing lighting. As is so often the case of business-focussed stays which have the ‘salaryman’ on mind, here it’s fantastically considerate of its female guests, too: how often do you even have your own little manicure-drying station on the dressing table? 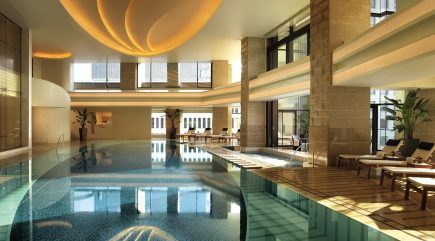 As well as finding time to spa on your city break, Peninsula Tokyo invites guests to try new crafts and creative experiences too, so you nourish mind and soul as well as body. They can arrange for you to try your hand at ukiyo-e, the woodblock-made images as celebrated in the Pictures of the Floating World artworks. Inspired by the washi-paper lanterns in the spa? Ask the concierge to arrange an artisanal paper-making workshop. Epicures too will find time here enriching— from the fine dining and flavours in the five outlets as well as an exclusive chance to have cookery class with head chef Teruyuki Kojima in the working kitchen. As anyone who’s watched the film Jiro Dreams of Sushi knows, it may take a little more than one session to make tempura and sushi of their standard, still, it’s always a thrill getting expert advice from the pros. I found Tokyo to be an efficient yet interesting, ordered yet intense, city and our guide took us to formal gardens and famous temples where girls in their rented kimono costumed posed for selfies. Truth is, I expected it to be a little bit more bonkers. I’m sure it is if you scratch more than the surface of this sprawling megalopolis. I’d have loved to have seen the pop-culture-loving otaku characters, but I got my dose of clichéd fun to dragging us around the corner for a little hit of karaoke in a private booth. Peninsula Tokyo is distinguished, well designed and reassuringly restrained, and like my experience of Tokyo in general, softly spoken and elegantly operated—it’s rare that a spell in such a busy, populated city can feel so soothing. If you think the Swiss like things to tick smoothly, this extraordinary city makes them look positively Mediterranean. Luckily some of the calm of Peninsula Tokyo rubs off on you. Keihatsu Enlightenment Massage, 1 hour 50 minutes, JPY 41,000. Deluxe rooms at Peninsula Tokyo from JPY 63,000 per night. Return Business Class flights with ANA, direct from London Heathrow to Tokyo Haneda Airport, from £3,447, including tax. To book visit www.ana.co.uk.